They say his policies are great, but that the history of progressive politicians running within the Democratic party - from Jesse Jackson to Howard Dean to Dennis Kucinich - has failed over and over again. ASHLEY SMITH: I actually am excited that Sanders is galvanizing all this discontent that has been brewing prior to Sanders as a result of the economic crisis, the absolute barbarity of the capitalist system on every front. And he’s tapped into that, and given a broader expression than even Occupy did to a kind of anti-corporate, anti-capitalist sentiment that’s growing in the United States. But the problem is really the Democratic party and the politics of lesser evilism on the U.S. left. That people have tried for generations to try and take over what Kevin Phillips called the second-most enthusiastic capitalist party in America, that is, the Democratic party. And that strategy has failed. It failed in the 1930s, it failed in the 1960s, it failed in the Jesse Jackson campaigns in the 1980s, which were far more left-wing than Bernie Sanders is today. Certainly failed with the Kucinich campaigns and the Howard Dean campaign, who was the last insurgent out of the state of Vermont. The Democratic party is incapable of transformation. It’s rigged and organized by the top. People don’t decide nominees through these two parties, both these capitalist parties, the Democrats and the Republicans, as a book that’s written by Marty Cohen really documents. A book called The Party Decides, in which he goes through systematically decades of elections and shows that it’s the funders, the media, the party apparatchiks, the superdelegates that actually rig the nomination process for the anointed candidate of capital in both parties. So I think that’s the underlying contradiction that Sanders faces, and that’s why he’s doing all the right things in the wrong party. So the problem is not Sanders’ positions, but the strategy, and his promise that if he were to lose–which I think is more, more likely than not. 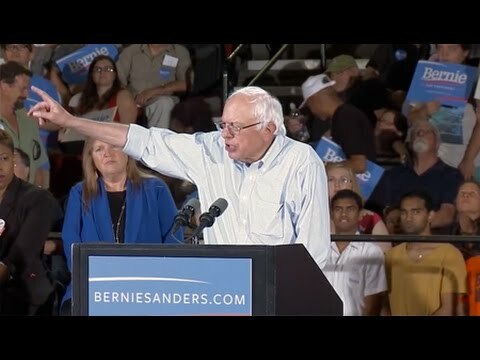 It would be a miracle if he won the nomination to the Democratic party–he’s promised to deliver his support and therefore his base to the likely nominee, which I think all odds are on Hillary Clinton at this point. Yet another imperialist hack, yet another corporate stooge, yet another neoliberal who will implement everything that Sanders opposes, and even more, everything Sanders supporters oppose. That’s why it’s the wrong strategy. He should have run as an Independent, should have run as a third-party candidate. That’s why people on the left who are not supporting Sanders are not holding up a litmus test but are criticizing a strategy that has failed for over 80 years.